The mainstream Pavilion lineup from HP is one of the series that received a somehow subtle overhaul. Without drawing too much attention to the outer chassis, the Pavilion 15 and 17 received a major overhaul on the inside taking place as mainstream everyday notebooks up to mid-range gaming notebooks with Core i7-6700HQ CPUs and NVIDIA GeForce GTX 960M GPUs. Of course, the design and build don’t scream “gaming material” at your face but the mid-range-ish plastic and design of the notebook keep the price as low as possible while delivering unmatched performance for the asking price. 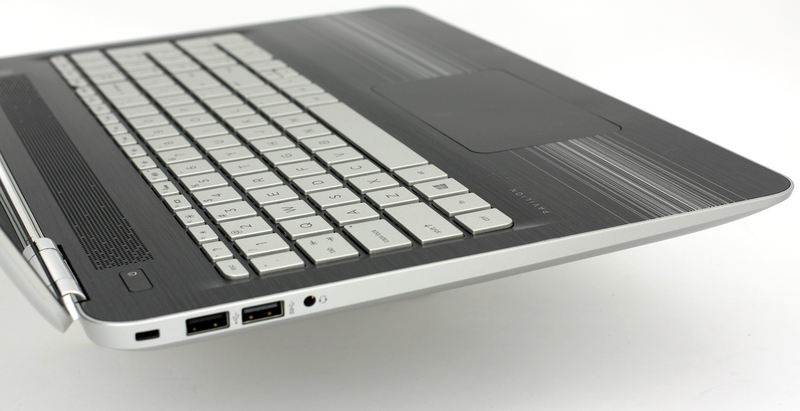 Only a few notebooks on the market can offer similar performance for around €800-900. In fact, this is a price for the Core i7-6700HQ and GTX 960M configuration so prices may go even low if you are willing to trade the CPU for the Core i5-6300HQ or a GTX 950M for that matter. But the main question remains. Will this 15-incher handle the heat and all that power from both chips? 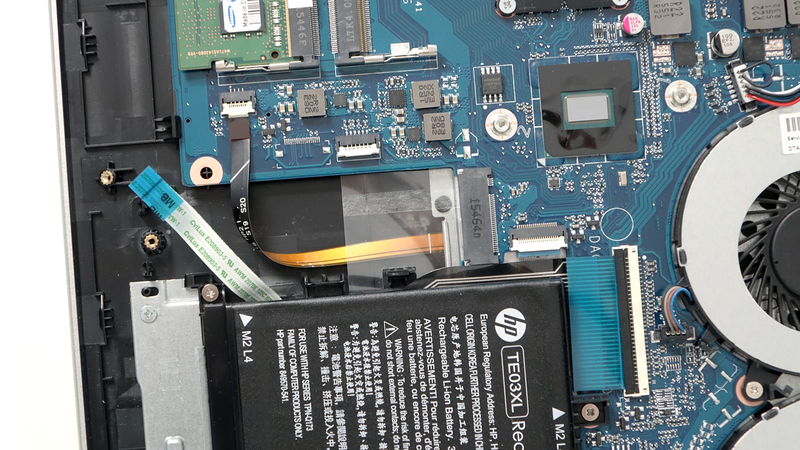 Well, HP has taken some precautions by removing the optical drive from the more powerful configurations in order to give some extra “breathing” room for the components. And another thing, does the price affect the overall quality of the product such as screen quality? We find out in our thorough review. We aren’t exactly sure what the final unit will ship with as our Pavilion 15 is a pre-production sample. 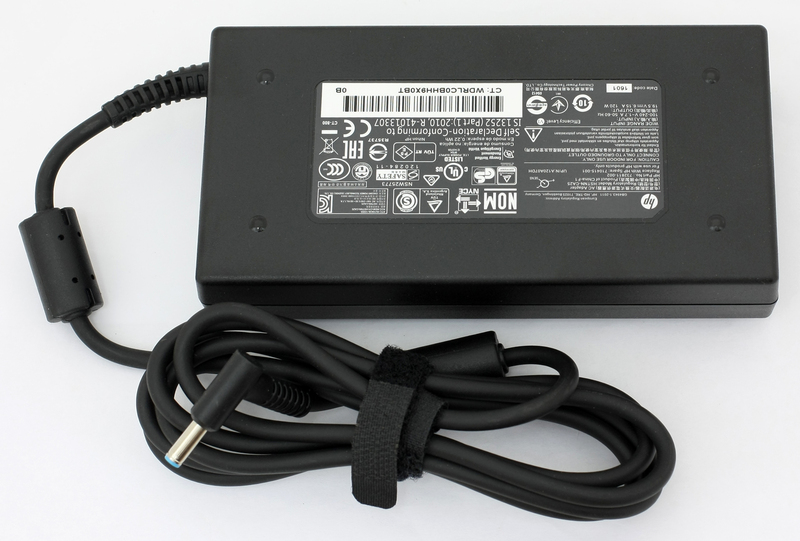 Anyway, the usual user manuals, AC adapter and power cord should be included. 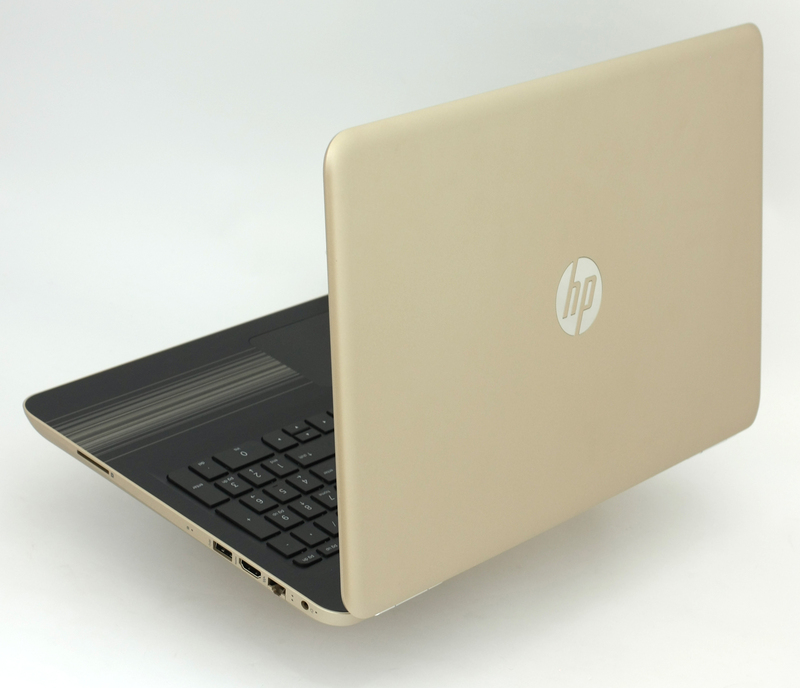 The HP Pavilion 15 is just a downsized version of the Pavilion 17 with the same choice of materials, textures, design, feel and input devices. Even the port distribution is identical, except for the missing optical drive, of course. Keeping the same clean design signature on the outside, the lid features silver-colored matte plastic, which on first glance reminds us of aluminum. And sure doesn’t inherit the metal’s sturdiness as well. 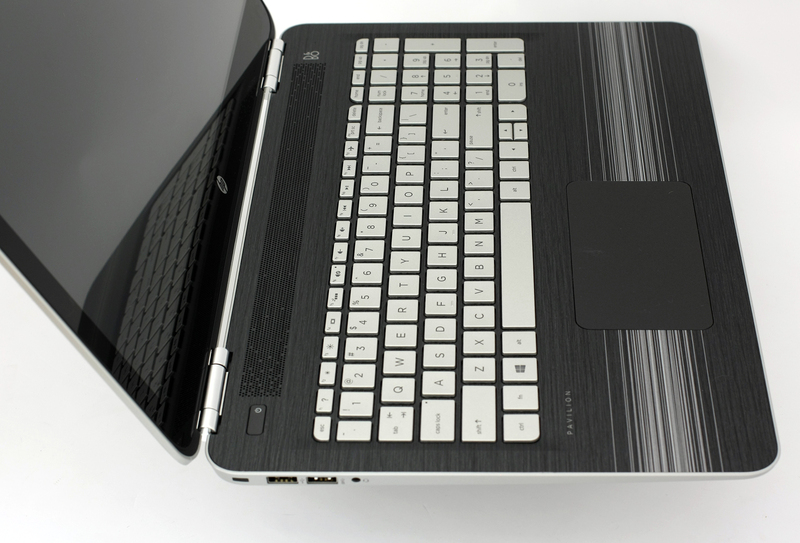 The plastic plate gives in under small pressure and can cause ripples on the other side where the LCD panel is placed. But being bouncy at this price range is the industry’s standard. Rarely you can find a notebook without build issues or inconsistencies. Hinges appear to be tight enough to keep the screen firmly in place, opening the machine with one hand is hard and surprisingly, using the touchscreen doesn’t cause the display to sway too much. The bottom cover features two long silicone “legs” and two big vent openings for extra airflow. 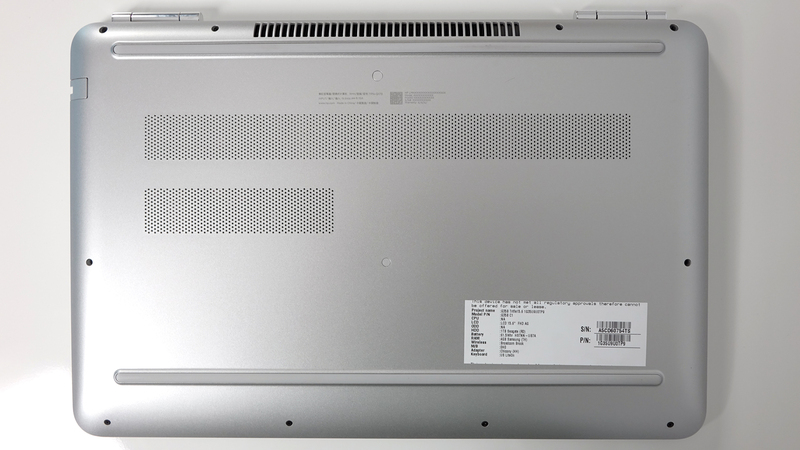 The sides aren’t as thin (26 mm at its thickest point) as some similarly priced competitors such as the Lenovo Ideapad 700 but it doesn’t fall too far behind from other powerful alternatives like the Acer Aspire V3-575G and V5-591G. As far as the interior is concerned, it’s identical to the one on the 17-inch variant. 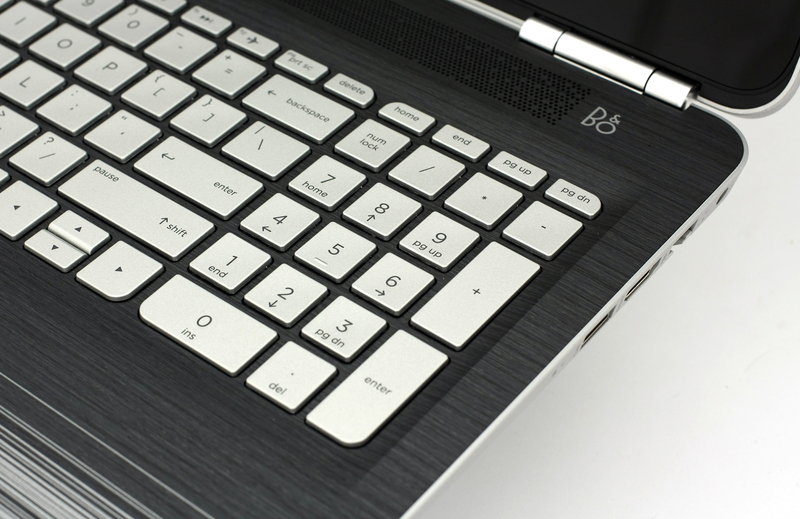 Same shallow keyboard with white LED backlight, stiff touchpad and mildly matte finish around the input devices. If the keyboard offered slightly longer key travel, it would have improved the typing experience a lot. 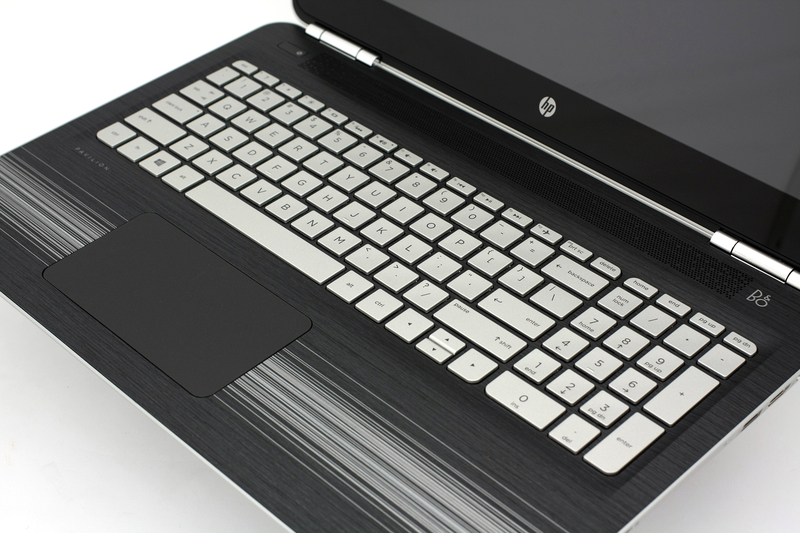 As a mid-range notebook, the HP Pavilion 15 offers pretty good build quality – nothing special, nonetheless. But we do need to note that we found no unnecessary holes, gaps or protruding edges. It’s really easy to gain access to the main components. You will only need a screwdriver to remove the screws. Then, just pry up the bottom and it will come off easily. 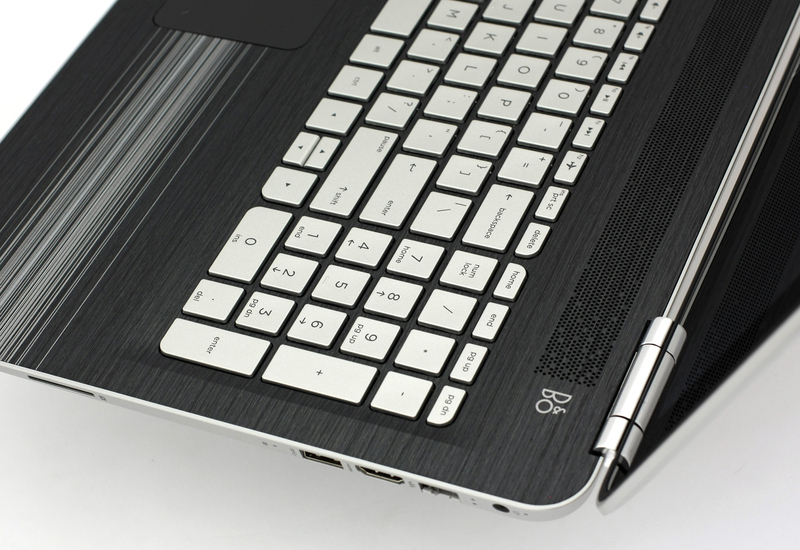 The usual storage setup is found featuring 2.5-inch HDD slot accompanied by an M.2 SSD slot supporting 2280 sticks. However, it came as a surprise that the motherboard actually supports NVMe drives to benefit from the absurdly high read/write speeds. 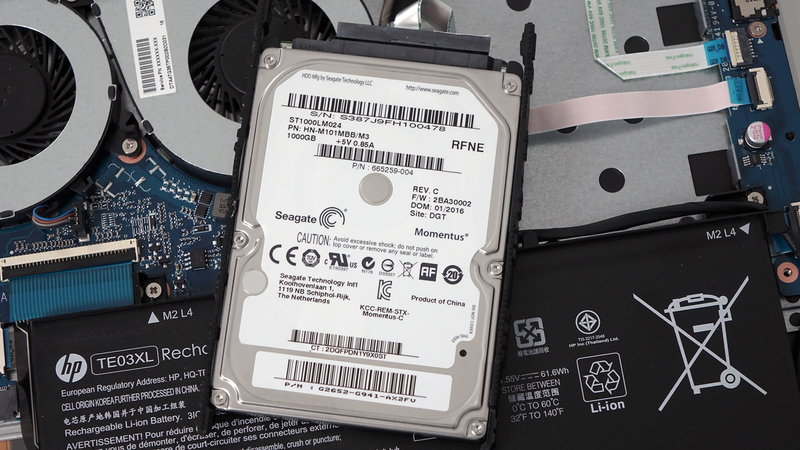 Interestingly, the 17-inch Pavilion doesn’t extend its support to PCIe NVMe but to SATA AHCI drives only. 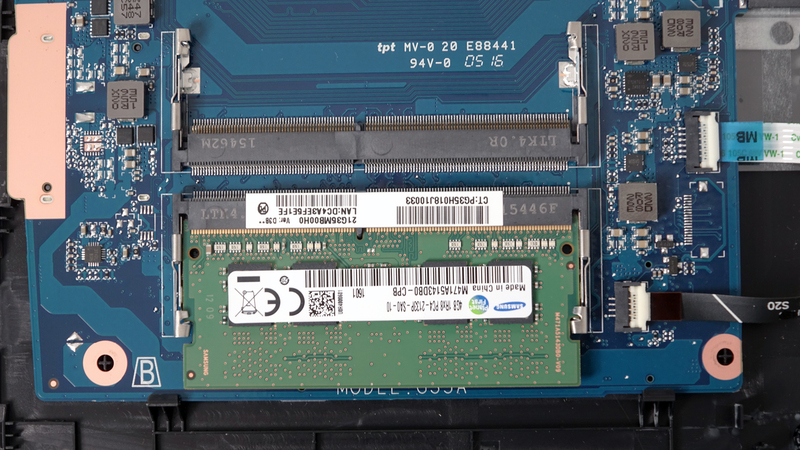 The motherboard supports two RAM slots up to 32GB of DDR4-2133 memory but our unit came with only one 4GB DDR4-2133 Samsung chip. 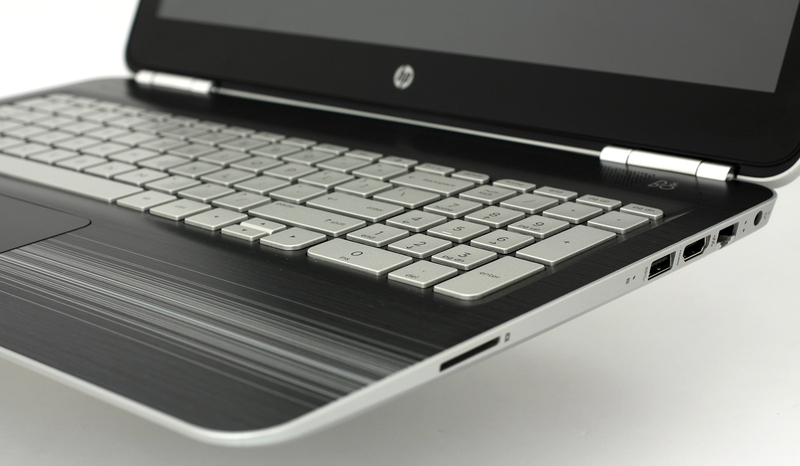 The HP Pavilion 15 ditched the user-replaceable battery design and now it houses the unit inside the chassis. It’s rated at 61.6Wh. 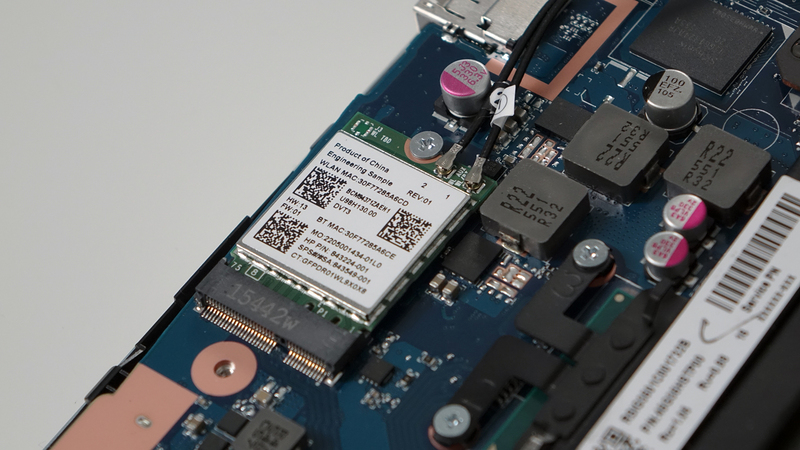 The Wi-Fi module is placed near the RAM chip slots but since it’s an engineering sample, the Wi-Fi card is unknown. Probably an Intel Wireless Dual-Band AC. 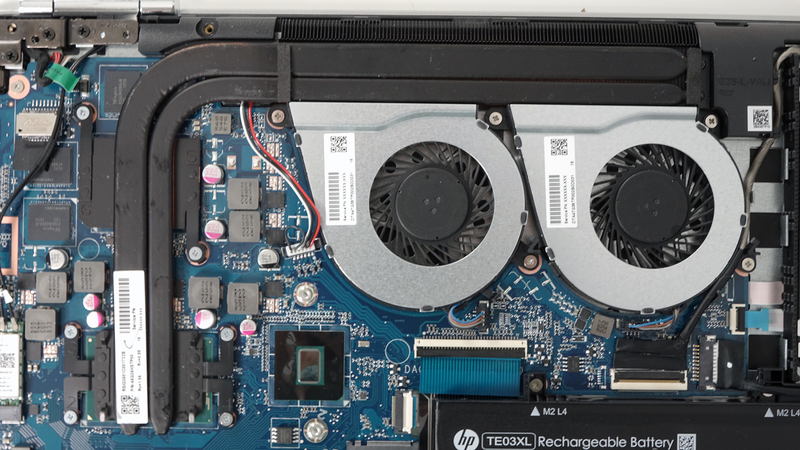 The two heat pipes connect both chips – the CPU and GPU – and transfer the heat to the two fans placed at the back of the machine. The cooling design strongly resembles the one on the Lenovo Y700 (15-inch), which didn’t do so well in our temperature tests. Since this unit is equipped with only Core i3-6100H and a GeForce GTX 950M GPU, temperature problems will not occur. However, we remain skeptical of the cooling capabilities if Core i7-6700HQ and GTX 960M GPU are involved. The Pavilion 15 (2016) features an IPS glossy touch panel with Full HD (1920×1080) resolution in a 15.6-inch diagonal. The model number of the display is listed as LGD0519 with 142 ppi and 0.18 x 0.18 pixel pitch. It can be considered as “Retina” when viewed from a distance equal or greater than 60 cm. The maximum brightness of the panel is 218 cd/m2 and 199 cd/m2 is the average value across the surface. So the maximum deviation is 17% in the bottom left corner. 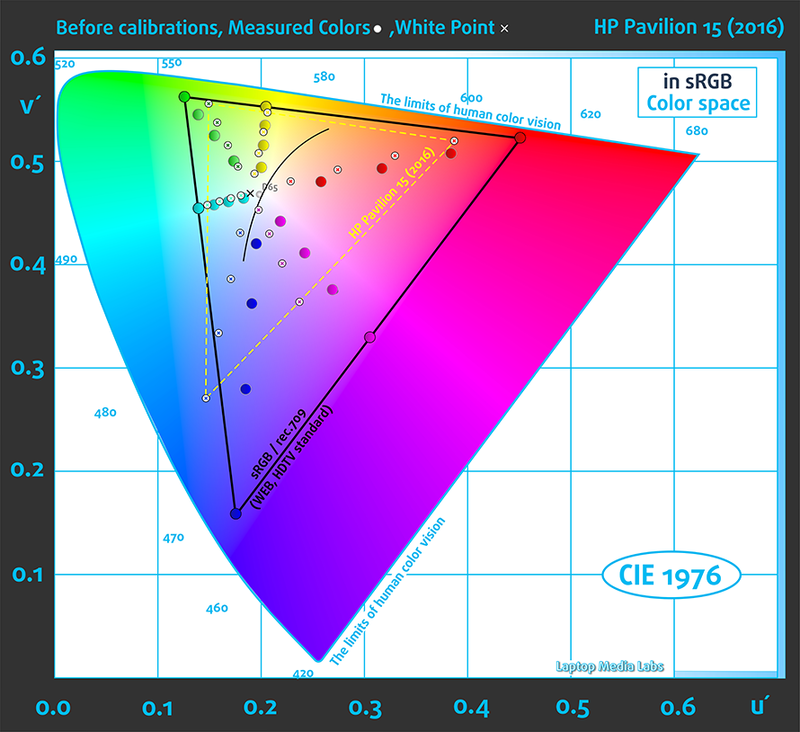 We also measured the color temperature – 7120K, which is slightly colder than the usual 6500K. Colors may appear slightly blue-ish but that’s barely noticeable. The maximum color deviation dE2000 is 4.6 again in the lower left corner and this is not so good result since values above 4.0 are unwanted. However, the most important is still the sRGB color space so the display covers just 53%. Not the best result to be honest. We calibrated the display to reach 6500K white point in sRGB mode. The measured contrast before calibration is low 640:1 and falls down to 600:1 after calibration. 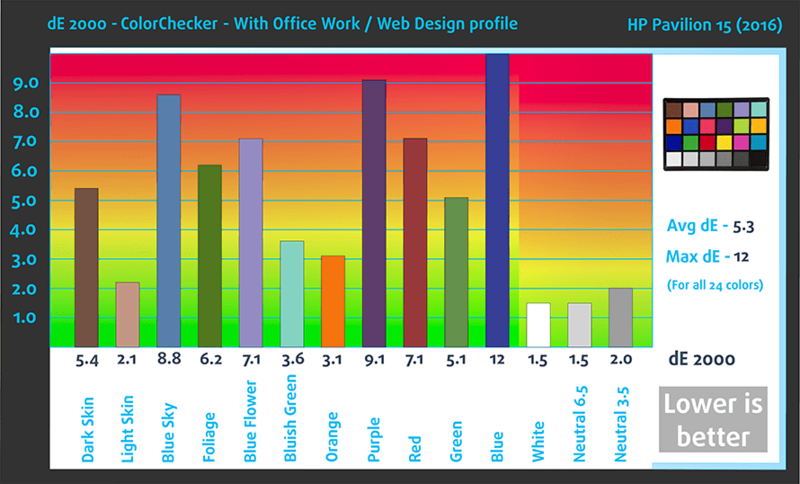 Below you can see the results from the accuracy color checker with 24 commonly used colors like light and dark human skin, blue sky, green grass, orange etc. 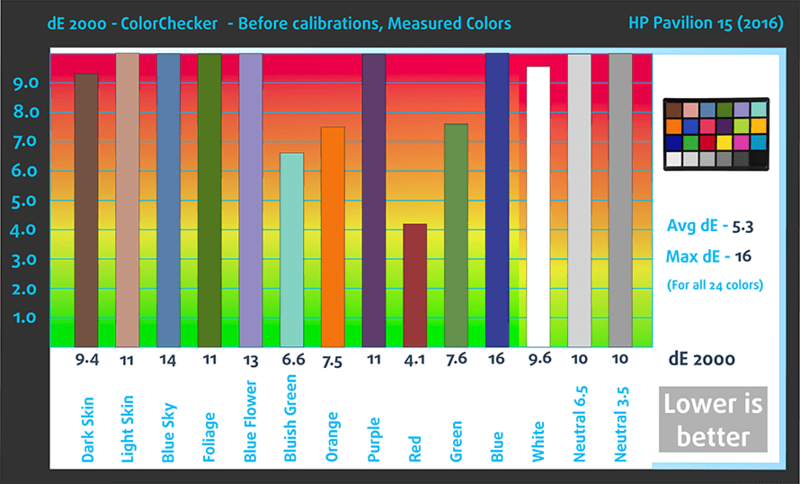 The results are before and after calibration.. The display uses PWM but it’s rather rare case in which the brightness is regulated by increasing the luminance to 200 cd/m2 and going back to 80 cd/m2 for about 43 microseconds. The final result is 140 cd/m2 with flickering around 23 kHz. The real pulse-width modulation, however, occurs from 40% brightness and below and will be felt by users with sensitive eyes. So keeping the brightness slider above 40% is advisable. The display has too many drawbacks to be called decent. We weren’t expecting any high results from the start but the low sRGB coverage combined with low maximum brightness and low contrast ratio makes this panel lackluster and drags behind the competition. On the other hand, our custom profiles can make things a tad better by reducing the blue light emissions, set color reproduction straight and improve the visibility in darker areas of the image. We would also like to mention that PWM is present only at 40% brightness and below and thus can be used by users with sensitive eyes, which is a big plus to consider. The sound quality is decent – only small distortions are recorded at low and high frequencies. The specs sheet applies only for the tested unit and may differ from your’s. 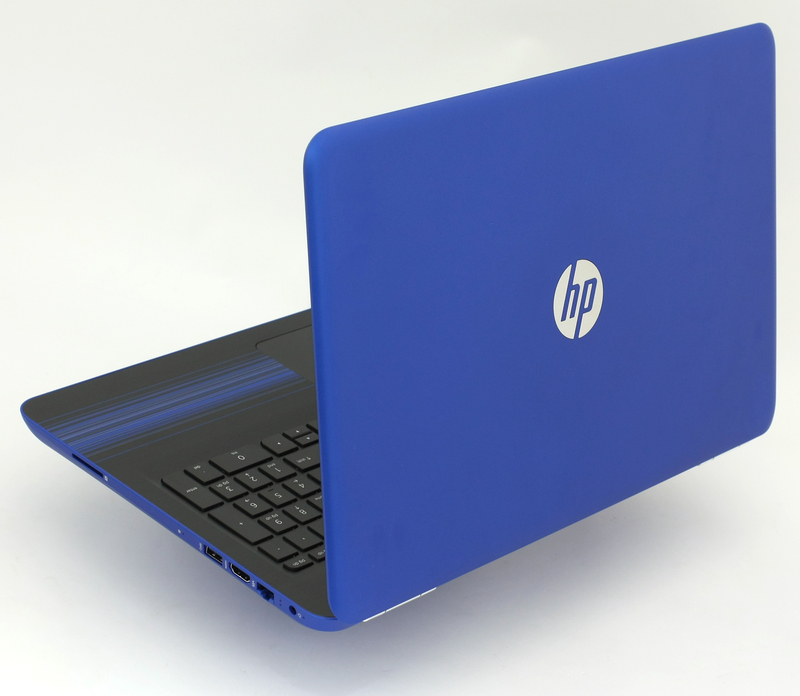 The notebook we used had a pre-installed Windows 10 (64-bit) but if you insist of performing a clean install of the OS, we suggest downloading the latest drivers from HP’s official support page. The battery performance is on par with most of the competition, although we suspect that since this is a pre-production sample, results might go up for the end user product. On the other hand, the configuration we tested has a 35W CPU while the rest of the configurations with Core i5-6300HQ and Core i7-6700HQ will drain the battery slightly faster due to the higher 45W TDP. 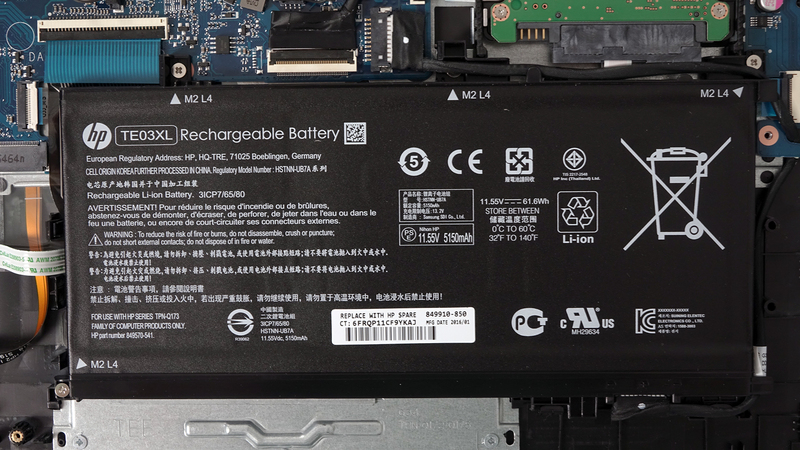 Of course, the 61Wh battery is big enough to get you through at least several hours of work. All tests were performed with Wi-Fi turned on at all times, Windows battery saver turned on and screen brightness set to 120 cd/m2. Slightly above average score – 362 minutes (6 hours and 2 minutes). Interestingly, slightly higher than the web browsing score – 375 minutes (6 hours and 15 minutes). It’s quite unlikely that you will start a gaming session without being close to a power source, but it’s good to know that you can play for about two hours – 134 minutes (2 hours and 14 minutes). The Core i3-6100H is a dual-core CPU based on the Skylake architecture from Intel. Although the processor doesn’t feature the Turbo Boost technology for increasing its frequency, the chip is clocked at 2.7 GHz with Hyper-Threading feature. The latter emulates one virtual core for each physical one and this way it can handle more processes at once. 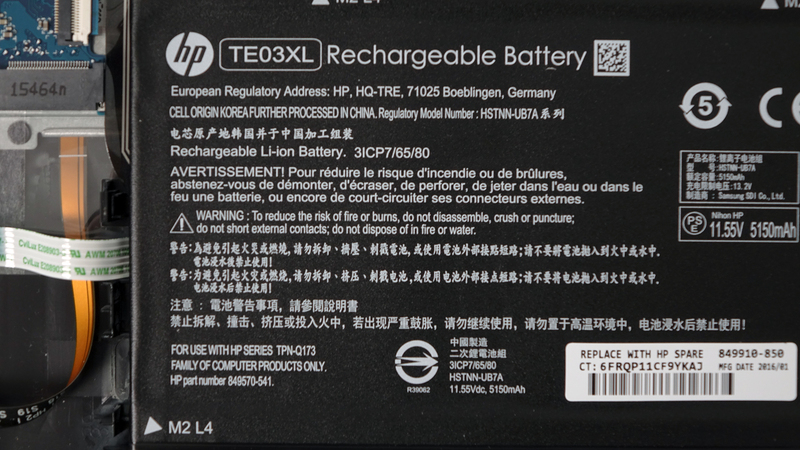 It can be considered as part of the high-performance Core i3 lineup. 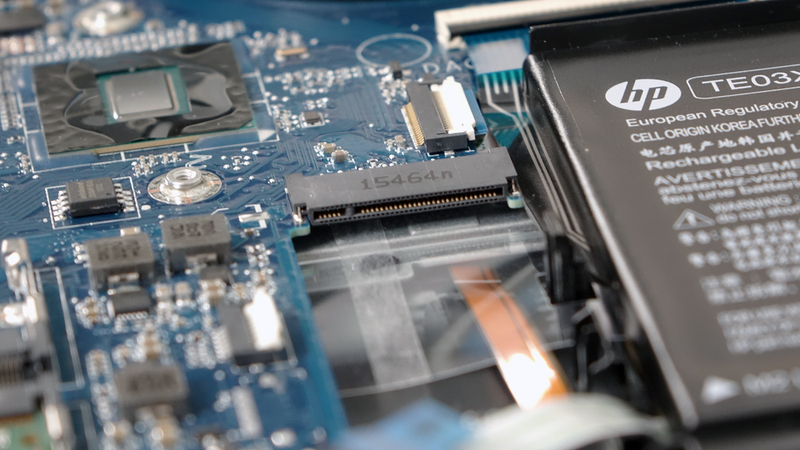 However, the higher TDP of 35W and relatively low performance comparable to Broadwell-U chips, make it an affordable solution suitable for office work and light gaming. 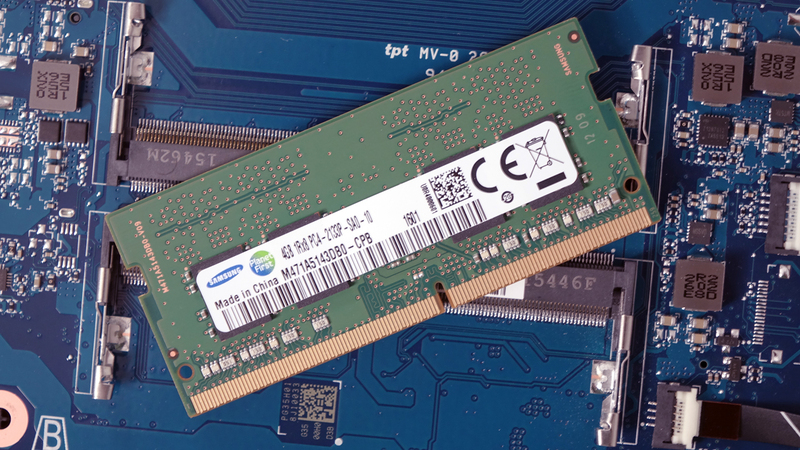 This TDP includes the dual-channel DDR4-2133/DDR3L-1600 memory controller and the iGPU – Intel HD Graphics 530. 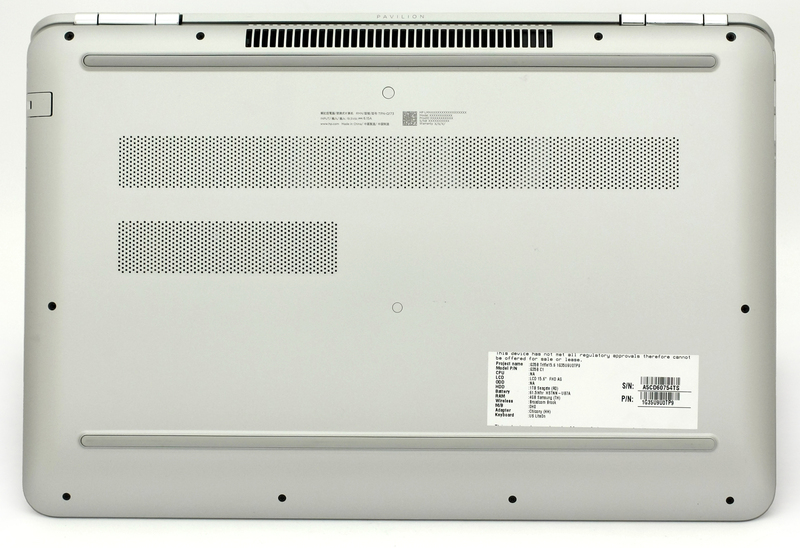 On the contrary to other Core i3 models, this one features an improved integrated GPU with 24 EUs (Execution Units) clocked at 350 – 900 MHz. Here you can see an approximate comparison between the CPUs that can be found in the HP Pavilion 15 (15-cc500, cc600, cc700) models on the market. 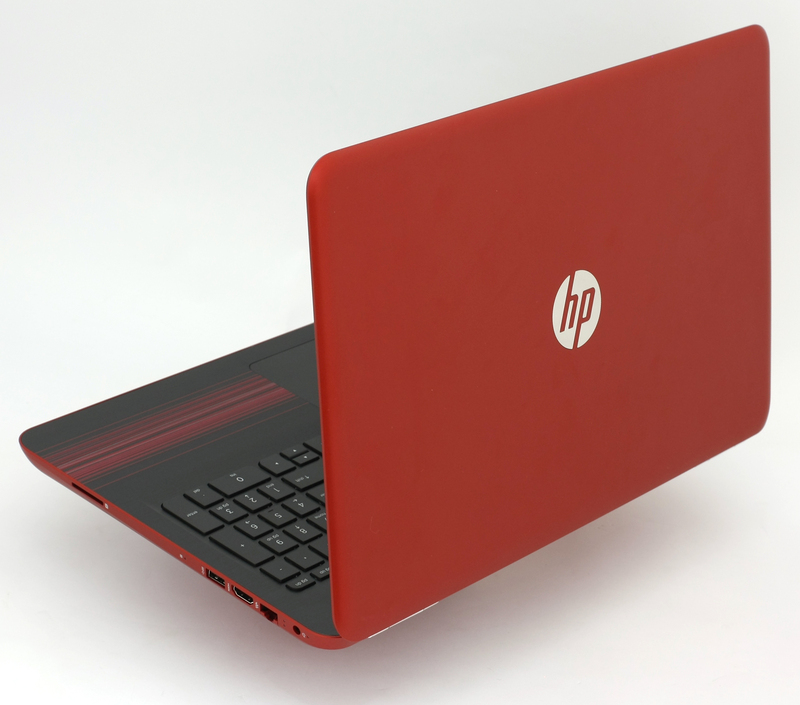 This way you can decide for yourself which HP Pavilion 15 (15-cc500, cc600, cc700) model is the best bang for your buck. Fritz is a chess benchmark that tests the computing capabilities of the CPU with various chess moves. The Intel Core i3-6100H managed 5.550 million moves per second. By comparison, one of the most powerful PCs, Deep(er) Blue, was able to squeeze out 200 million moves per second. In 1997 Deep(er) Blue even beat the famous Garry Kasparov with 3.5 to 2.5. Here you can see an approximate comparison between the GPUs that can be found in the HP Pavilion 15 (15-cc500, cc600, cc700) models on the market. 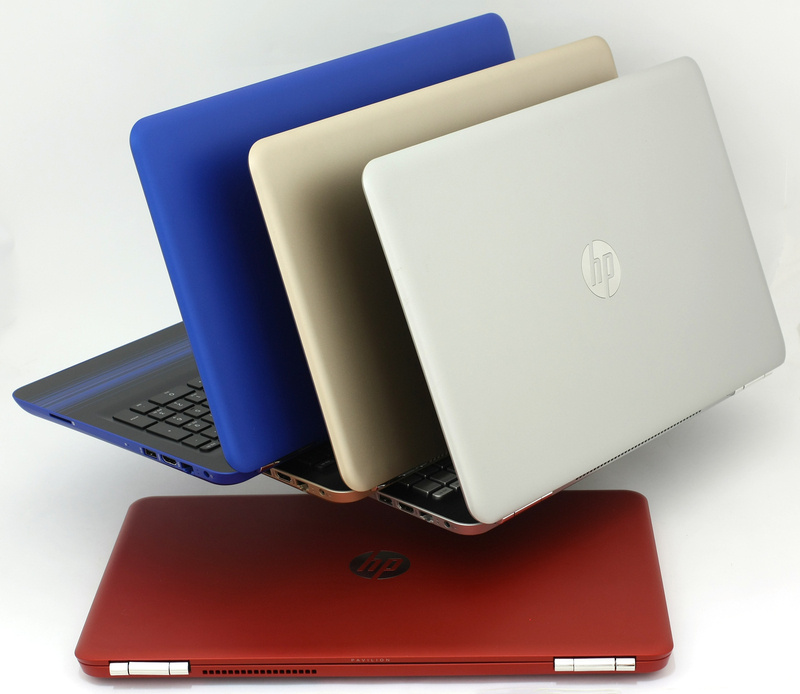 This way you can decide for yourself which HP Pavilion 15 (15-cc500, cc600, cc700) model is the best bang for your buck. This sort of stress test doesn’t represent real-life situations as the general user won’t be able to reach 100% CPU and 100% GPU loads for longer periods of time. 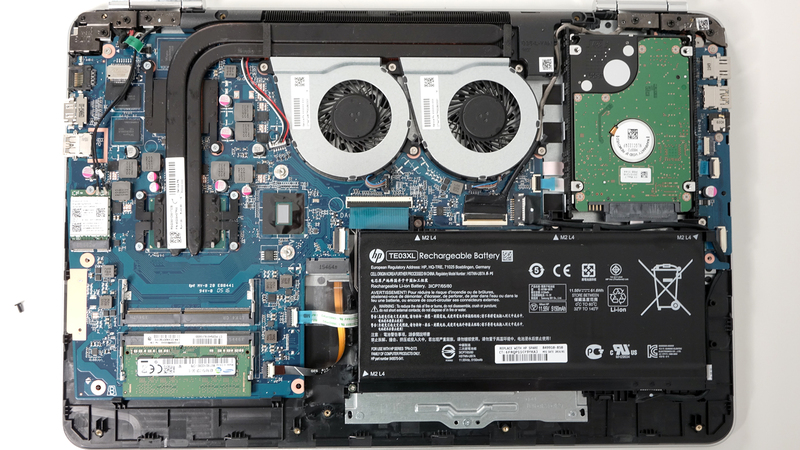 Still, this method gives us a good insight about the cooling system and the overall stability of the notebook in the long run. We start off with 100% CPU load for an hour. At this point, the CPU was able to maintain maximum operating frequencies of 2.7 GHz while keeping temperatures pretty low at 59 °C. 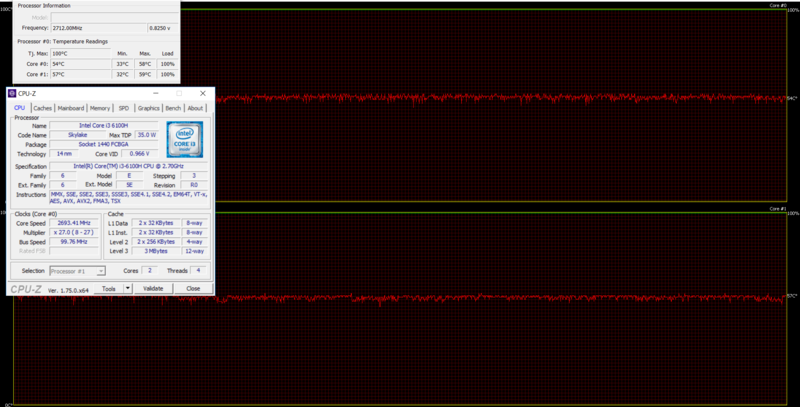 After an hour, we turned on the GPU stress test as well. 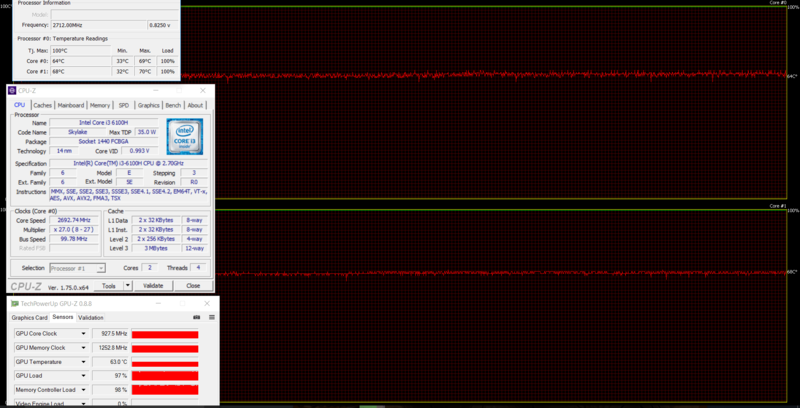 The temperature of the CPU went up to 70 °C while the GPU was running smoothly at 63 °C. No throttling occurred and both chips remained at safe temperatures. However, we think that the system will have harder time handling the more powerful configuration including the Core i7-6700HQ CPU and the GTX 960M GPU. The heat on the surface was on the safe side and didn’t cause any discomfort. On the image quality front, the Full HD touch IPS version, which we reviewed, isn’t one of the best we’ve tested and we consider it as slightly below average for this price range. 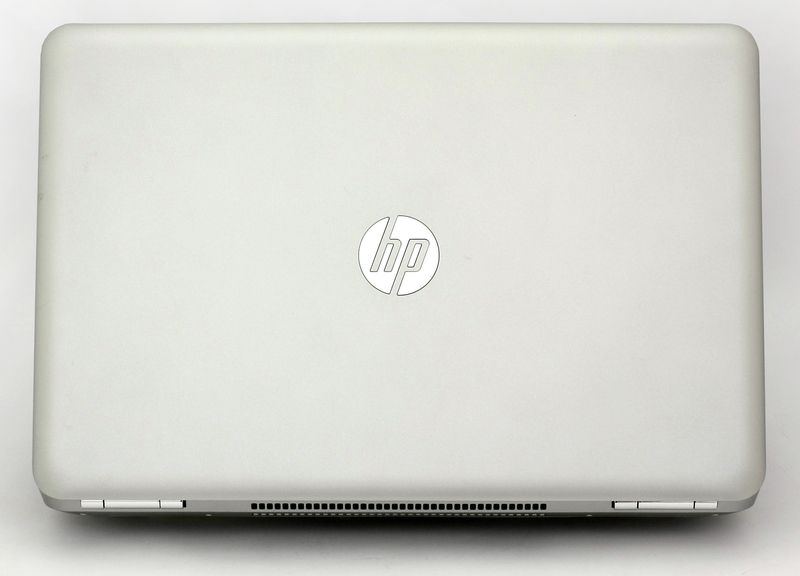 It seems that HP had to settle for one more thing when building the high-performance version of the Pavilion 15. Nevertheless, the only serious drawback for the device’s screen is the low maximum brightness and probably the presence of PWM below 40% luminance. But since it’s a dim display, you won’t probably go below 40% anyway. You can always take advantage of our custom profiles, though. They will improve the overall visibility in the darker areas of the image, reduce blue light emissions and will definitely help with the color accuracy. Unfortunately, this is information we can’t give you right now. But stay tuned because we will post more about the matter pretty soon. Hello! Thank you for reviews! Is it possible to review Dell Vostro 5459? There is only preview of this model, but I really want to see if it uses PWM. whats the noise level of this computer? The scroll bar function is so unstable, it ranks as the most frustrating computer we have ever used. 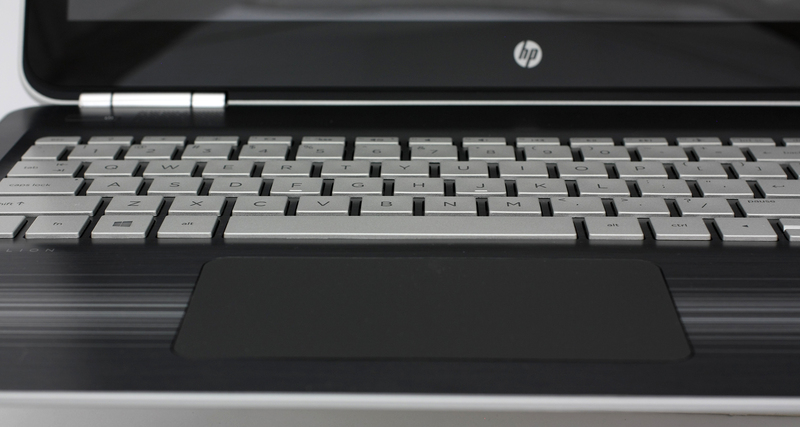 Do not buy HP laptos. This is worst laptop. I purchased it with original window 8. And from the first day it started creating problems. Its mouse touchpad is very bad. I got message for updating window from 8 to 8.1 and when I updated the window, from that date internet is not working on the laptop. So I suggest you not to buy this company’s laptop. I have saved many friends of mine by stopping them to purchase this laptop. good appearance but with poor performance . few months afters i bought this laptop, i’m already experiencing lags, i have to reformat it so that the responding process becomes fast, can’t even handle my 3D apps that im using for my job, even the games im into.. . awfull.. .